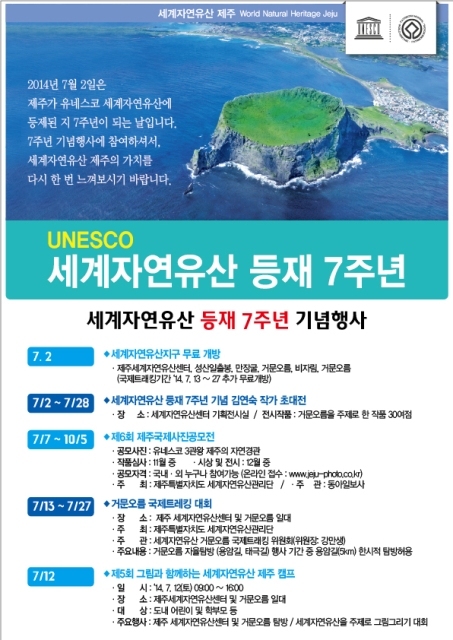 To mark the seventh anniversary of Jeju Island’s designation as a UNESCO World Natural Heritage site a number of special events are being held by World Natural Heritage Jeju throughout July. Jeju World Natural Heritage Center, Seongsan Ilchulbong Sunrise Peak, Manjanggul Cave, Geomun Oreum, Bijarim, Hallasan National Park (parking free). - The Lava Trail (5 k.m.) and Taegeuk Trail on Geomun Oreum will be open to trekking without reservation, as is required throughout the rest of the year. Visitors can arrive between 8 a.m. and 1 p.m. Winners announced in November with an exhibition held in December.